Seventh Generation Coupons: Baby Wipes, Diapers & MORE! Home Amazon Seventh Generation Coupons: Baby Wipes, Diapers & MORE! There are OVER 40 new Seventh Generation Coupons that will save you up to 25% off at Amazon!! These can be combined with Subscribe & Save or Amazon Family to save even more!! The prices are crazy low for this brand, like diapers as low as $.14/diaper AND Seventh Generation Free & Clear Baby Wipes as low as $.02/wipe. SEVENTH GENERATION COUPONS ON AMAZON! 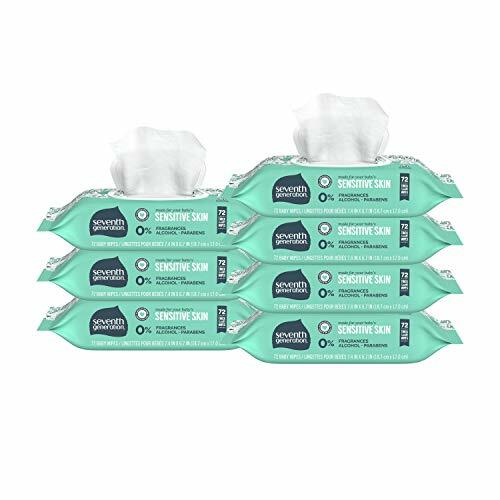 Seventh Generation Free & Clear Baby Wipes as low as $10.76 ($.02/wipe) when you choose Subscribe & Save with at least 5 subscriptions in one month & clip the 30% off Amazon Coupon! Seventh Generation Baby Diapers, Newborn, 144 Count (4 pk) – as low as $20.42 ($5.11/pack!) with Amazon Family discount & 30% Amazon Coupon! Seventh Generation Baby Diapers, Size 1, 160 Count (4 pk) – as low as $23.98 ($5.99/pack!) with Amazon Family discount & 30% Amazon Coupon! Seventh Generation Baby Diapers, Size 2, 144 Count (4 pk) – as low as $19.50 ($4.87/pack!) with Amazon Family discount & 30% Amazon Coupon! Seventh Generation Baby Diapers, Size 3, 124 Count (4 pk) – as low as $19.96 ($4.99/pack!) with Amazon Family discount & 30% Amazon Coupon! Seventh Generation Baby Diapers, Size 4, 108 Count (4 pk) – as low as $19.96 ($4.99/pack!) with Amazon Family discount & 30% Amazon Coupon! Seventh Generation Baby Diapers, Size 5, 92 Count (4 pk) – as low as $19.96 ($4.99/pack!) with Amazon Family discount & 30% Amazon Coupon! Seventh Generation Baby Diapers, Size 6, 80 Count (4 pk) – as low as $19.50 ($4.87/pack!) with Amazon Family discount & 30% Amazon Coupon! There is no commitment with Subscribe & Save. You can cancel at any time! Plus, get free shipping!! Details here! If you choose one-time purchase, Amazon Prime members get FREE 2-day shipping!! If you are not a Prime member, get FREE shipping when you purchase $25 or more of eligible items across any product category. Smooth, soft, and clean – the way a baby’s bottom should be. Seventh Generation Free & Clear Baby Wipes are made for baby’s sensitive skin and contain 0% fragrance, alcohol, parabens, or phenoxyethanol. Our thick, soft wipes are strong enough for big messes while being gentle on newborn baby’s most precious, delicate skin. These baby wipes are moistened with plant-derived skin conditioners like aloe vera and are safe for baby, hands, and face. The flip-top package design locks in moisture to keep wet wipes fresh and allow for easy, on-the-go dispensing. Our hypoallergenic and fragrance free wipes are dermatologist tested and clinically proven to be gentle on baby’s skin. It’s all good, baby. Caring for a little human is a magical undertaking, and we’ve developed an entire line of baby skin care products, wipes, and diapers to bring peace of mind to your journey. For every life-changing milestone, you deserve baby care you can trust. Buy the Seventh Generation Baby Wipes, Free & Clear with Flip Top Dispenser, 504 count from Amazon. Next articleEclipse Polar Ice Sugarfree Gum (4 Bottles) Stock Up Deal! !